Sometimes the basics just cannot be improved upon. Ken Roebuck, who was a true spaniel man, had the basics down pat. 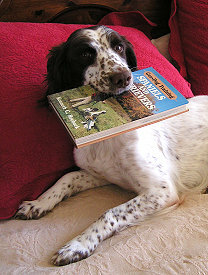 Gun-Dog Training Spaniels and Retrievers, written in 1982, is an illustration of those basics. For me, it was a glimpse of just how complicated we have made this thing to be. So here we are with yet another review of another training manual. What makes this one different? For one thing, it is actually limited to, or better yet targeted at the gun-dog trainer. At the start of the book, he states: "This book is written for hunters who wish to train their own gun dog." And further along: "I do not cover field trials for either type of dog (spaniels or retrievers), although some of the training I describe does in fact relate to that sport." 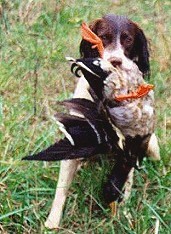 For some spaniel trainers, the distinction between a fully-trained, field-trail dog and a gun dog is one of steadiness. Roebuck made no such distinction. He states: "My object is to explain to the amateur how to train his gun dog to a higher standard than he had realized was possible." "Most hunters are blissfully unaware of the lack fo control they have over their dogs, and appear to regard as trained any dog that will somehow find a bird within shooting distance." Roebuck, gained much attention through his Flush columns in Gun Dog magazine, but also as a professional trainer based for many years in Copake, New York. A professional trainer first, and writer second, he offered some insight into knowing and reading our dogs. To this end he avoided a one-size-fits-all technique, preferring instead to allow "each dog to develop at its own pace" as the "best way to approach the whole process." "The best advice I can give on training is: A little at a time, and often." There is a pattern to most elementary training books, and this one is no exception. Roebuck started the book off, predictably, with a chapter on "Choosing Your Dog." He jumped right in to a discussion of field bred vs. show bred, stating, "From time to time I have gun-trained dogs that have been bred from show lines and they have turned out to be useful gun dogs, but for the very small number that do, many more fail." 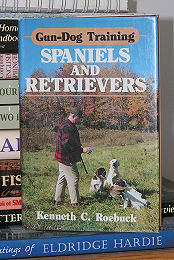 At this point, I should point out that this book is about flushing dogs, i.e., spaniels and retrievers, with the emphasis on upland game work. Roebuck moves on to basic puppy training, which of course includes hup, come and retrieving and then introduction to gunfire and water work. The more advanced sections give some tips on using the retrieve-r-trainer (dummy launcher) and pigeon work. He then discusses advanced retrieving and actual hunting, including steadiness to flush. The book is not lengthy, nor does it list drill after drill in depth, but is useful in giving one an overview of the entire process, which is of course essential in making a pup into a fully trained gun dog.